University of Oklahoma Press, 9780806141367, 349pp. The two-hundred-year-old myth of the "vanishing" American Indian still holds some credence in the American Southeast, the region from which tens of thousands of Indians were relocated after passage of the Indian Removal Act in 1830. Yet, as the editors of this volume amply demonstrate, a significant Indian population remained behind after those massive relocations. 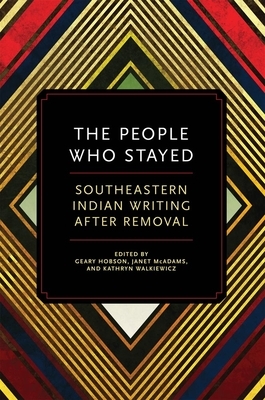 The first anthology to focus on the literary work of Native Americans who trace their ancestry to "people who stayed" in southeastern states after 1830, this volume represents every state and every genre, including short stories, excerpts from novels, poetry, essays, plays, and even Web postings. Although most works are contemporary, the collection covers the entire post-Removal era. Some of the contributors are well known, while others have only recently emerged as important literary voices. All of the writers in The People Who Stayed affirm their Indian ancestry, though many live outside the Southeast today. As this anthology demonstrates, indigenous Southeastern writing engages the local and the global, the traditional and the modern. While many speak to the prospects and perils of acculturation, all the writers bear witness to the ways, oblique or straightforward, that they and their families continue to honor their Indian identities despite the legacy of removal. In an introduction to the volume and in headnotes on each contributor, the editors provide historical context and literary insight on the diversity of writing and lived experiences found in these pages. All readers, from students to scholars, will gain newfound understanding of the literature -- and the human experience -- of Native people of the American Southeast.